The landscape of India bursts with energy. Travel tends to pull my mind in diverse directions so I like to look for patterns in the masala of architecture and culture I’m seeing here. We have an assortment of elastic bands littering the area around the telephone in our kitchen at home in Calgary. The delivery person uses them to tie around the floppy morning newspapers transforming them into manageable projectiles that land with a thud on our front porch everyday. Perhaps an image of India as an elastic band that pulls pieces together will help me manage what I’m seeing. Last week we attended an evening performance of Kodavas traditional tribal dance. The sky was black except for bright stars and a brilliant full moon. The dark skinned male performers danced by a blazing bon fire. With long sticks and metal swords they clacked and clanged while dancing in a big circle to the haunting nasal sound of a lone vocalist. The tribe is said to descend from Alexander the Great’s army that invaded India in 327 BC. They migrated down the Malabar Coast (the southwest coast of India) and settled in the fertile hills of the Western Ghats. Now, a hundred or more generations later, they are almost fully integrated into Indian society but they still bring something different, something Greek, into the spicy Indian mix. 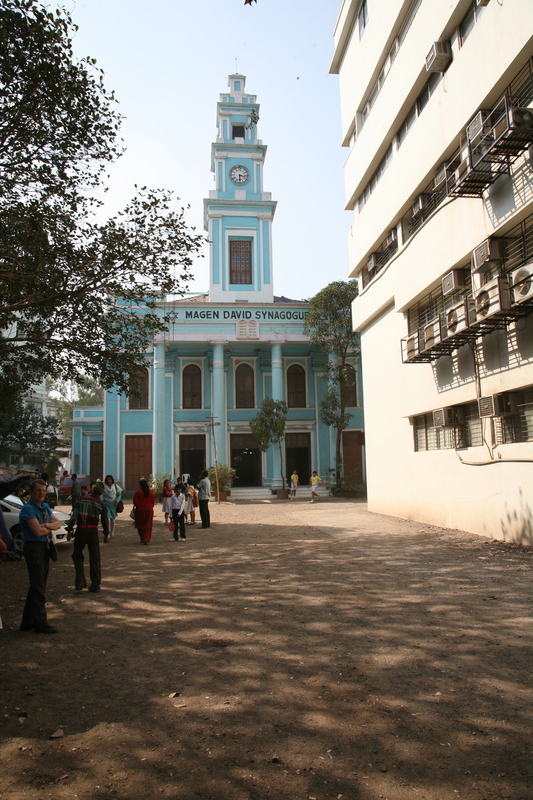 In Mumbai, we visited the newly renovated Magen David Synagogue. A friend of mine helped with the renovation, and I wanted to see it first hand. It is an open, brightly lit beacon in a crowded neighbourhood. We could hear the sounds of school children singing in the adjacent Muslim school and the children played in the courtyard in front of the synagogue. Chairs and carpets, the aftermath of a major social event, were being removed from the rear of the building. In the middle of the 19th century Jews escaped persecution in Iraq (which was their home at the time) and came to Mumbai to settle. The congregation of 20,000 persons was reduced substantially after the chaos resulting from partition of India in 1947. Families dispersed to the far corners of the globe where they flourished. However the Jews left a legacy in India and the renovated synagogue is a good example of continued investment. 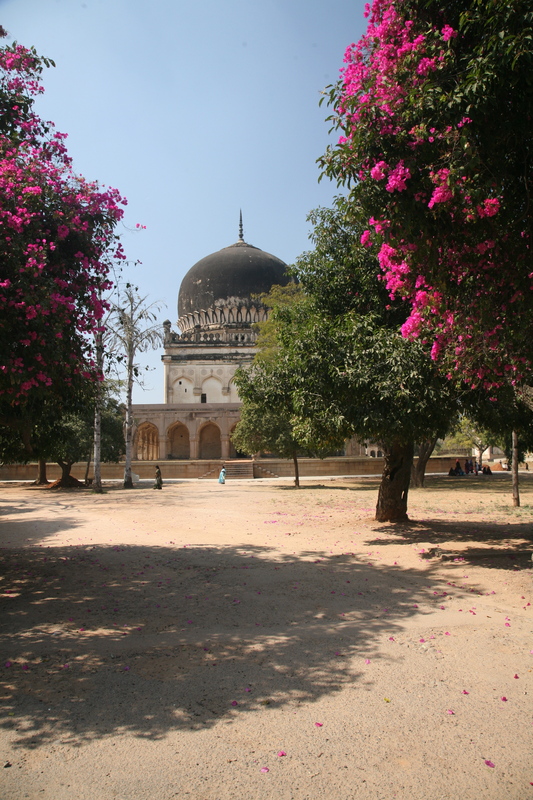 The Qutb Shahi Tombs are set in a peaceful landscape in Hyderabad that, in the late 17th century, was overrun by the Mughals, creating a dynasty that lasted until India’s independence. 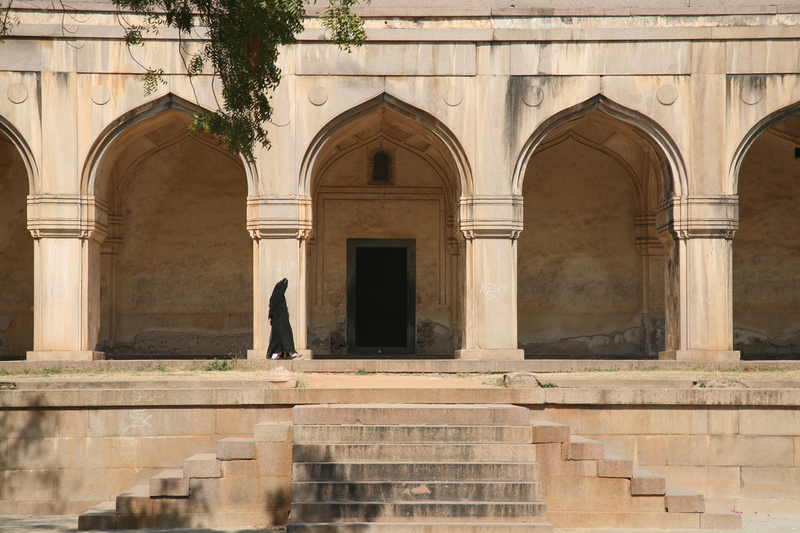 The traditions of Islam flourished and the city became a focus for the arts, culture and learning. The story is a sub-plot of a bigger cultural flood, that of the invasion of India by the Mughals in the 15th century, adding one more piece to their vast empire part of which included Persia. While less kind to other prisoners, the Mughals recognized the importance of artists and craftsmen in the embellishment of their capital, Samarkand, then one of the most beautiful cities in the world and Persians artists were brought to that city to contribute their talents to its magnificence. As the Mughal influence spread across the sub-continent, the work of Indian stonemasons was combined with the talents of the Persians. And what a legacy they left; elegant expansive palaces, impenetrable and ingenious fortresses, delicate domes silhouetted against the blue sky and elegant details. 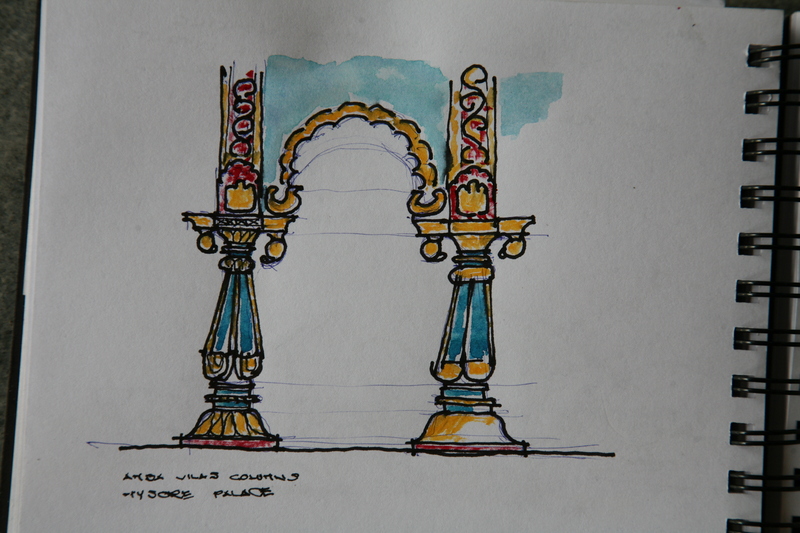 Mughal architecture has today become the icon of Indian design. The English also left no less of a legacy. An English architect designed the Wodeyar dynasty Palace at Mysore in 1915, replacing an earlier structure that had burned down. I am told that it is in the Indo-Sarcenic style. Perhaps. But I cannot help but feel that the term itself cages the enthusiasm and spirit of the design that probably should be left untamed. It is an exuberant collage of fortress-like corners, broad arches, light domes (I counted 10). Colonnades defy gravity, resting on pillows and lotus leaves with arches that spring like the ruffle of a peacock’s tail. Cast iron columns, fabricated in Scotland, rise to support a delicate glass roof. To remind the viewer that this is not frivolous business, the walls a lined with a brilliant display of paintings with troupes on foot, horseback and elephants. The architecture of the English colonial period is seen across India and like the Mughals before them, they have made a lasting contribution. Is the elastic band I’m looking for to wrap up my understanding of architecture and culture into a pattern in India a broad one, like the masala of Greeks, Mughals, British and the Iraqi Jews, all of whom came and injected their vitality into the heart of the sub-continent? Wait a minute. I’m in a small village outside Tellicherry in Kerala and a Theyyan Dance is in full swing. The whole village is in attendance to witness the spirit descend into the bodies of the five dancers. Their enormous red headdresses gyrate in the hot sun to the erratic beat of drummers and a short, and very odd sounding trumpet. A group of elders comes out to push back the crowd. The wild erratic movements of the dancers need space as they leap into the air and run clockwise, then counter-clockwise around a small temple. As quickly as the dance takes hold, it comes to a stop. Villages seek advice from the dancers, and judging from the expression of their faces, receive sage counsel. They have been blessed. The spirits have returned to their village once again. I think about my elastic band analogy. It would not fit this one. No band would stretch that far. This entry was posted in Architecture of India, India, Silk Road, Uncategorized and tagged architecture of India, Magen David Synagogue, Mysore Palace, Qutb Shahi Tombs, Theyyan. A beautiful post!! 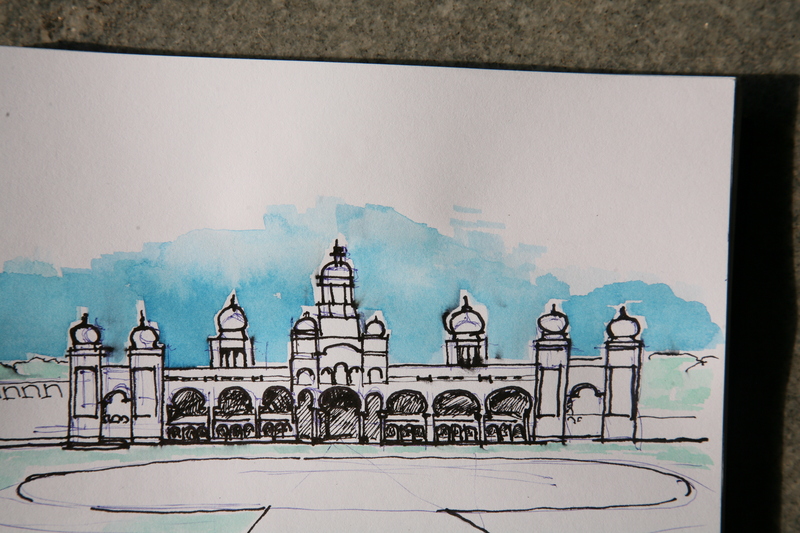 I too have been swept away by the beauty of Indian art, architecture and culture. 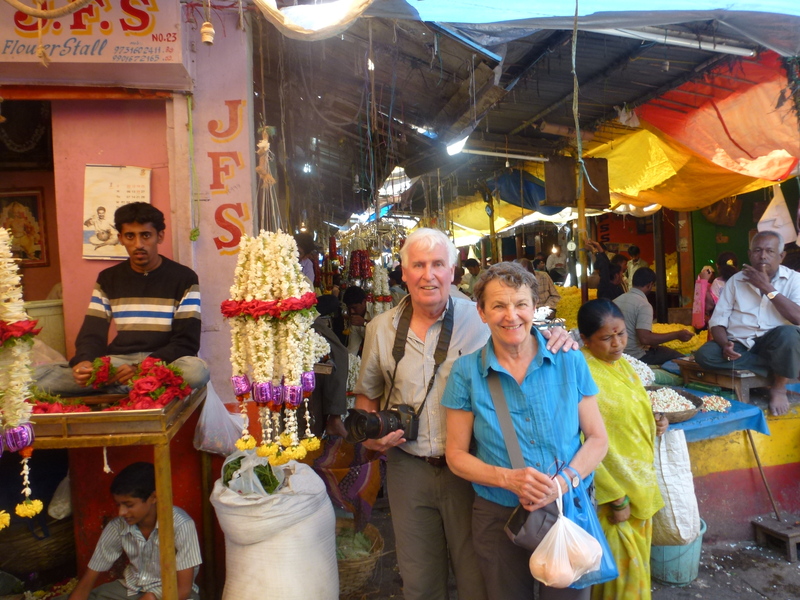 India has not only been a melting pot, but also a rich source of art and culture for so many eons…. No matter how many of the lotus petals you manage to unfurl, there is always a new and fascinating jewel right around the corner. Thank you for your lovely comments Jeanette… you, a kindred spirit out there somewhere. I look forward to reading more of your writing.